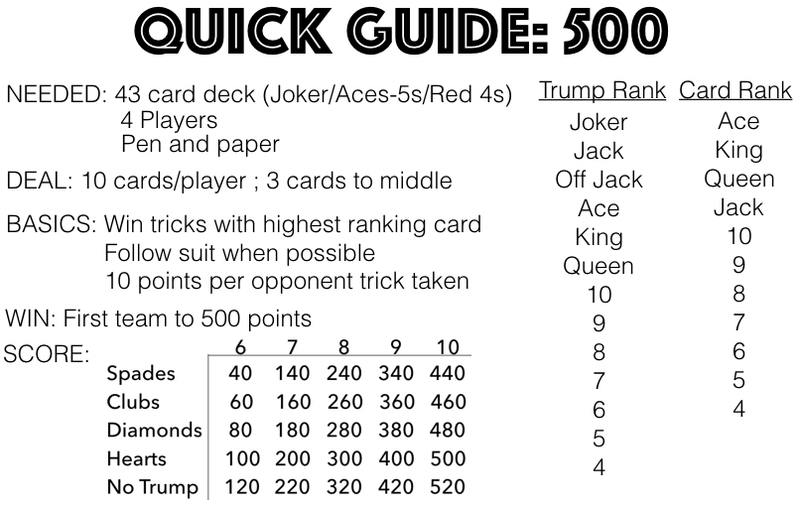 500 is a fun trick-taking card game. Be the first team to 500 points to win this game. You will find the video tutorial and explanation for 500 below. Also, be sure to check out the quick guide to help you learn as you play. Deal: Each player is dealt 10 cards. First a set of 3 cards to each player. A set of 3 cards to the middle. A set of 4 cards to each player, then a set of 3 cards to each player. Objective: Score points through bidding and winning tricks as a partnership team. A trick is created by each player taking a turn playing a card. The winner of the trick is the player with the highest ranking card. Card Rank: Highest to lowest – TRUMP: Joker, Jack, Off Jack, Ace, King, Queen, 10, 9, 8, 7, 6, 5, 4 (if applicable). NON TRUMP: Ace, King, Queen, Jack (if applicable), 10, 9, 8, 7, 6, 5, 4 (if applicable). The trump suited cards will outrank all other suited cards. Bidding: The player left of the dealer is first to bid or can pass on bidding. When bidding, a player will announce how many tricks his/her team will win, and what suit he/she wants trump to be. A bid of 7 heart means a team needs to take 7 tricks and wants hearts as the trump suit. Each bid going forward has to be higher than the previous bid. A player can bid the same number of tricks in a higher suit, or bid more tricks in any suit. A no trump bid means during the round no suit is considered trump. The Joker is still considered trump. The bid winner gets to look at the 3 cards that were dealt into the middle, and then will discard any 3 cards he/she chooses. Game Play: The bid winner leads the first trick. Every player is required to play a card in the same suit as the first card played whenever possible. If a player does not have a card in the lead suit, he/she can play any card. The winner of the trick is the player with the highest ranking trump suited card. If no trump suited card was played, the winner of the trick is the player with the highest ranking card in the lead suit. The player that wins the trick leads the next trick. At the end of the round each team’s tricks are counted. If a team does not win the amount of tricks bid, they go negative the amount for the bid. If a team wins all 10 tricks in a round and their bid amount won is less than 250 points, the team is awarded 250 points. If a no trump bid is played, the joker is still considered trump. When led, the player must call a suit for others to follow. If not led, it can only be played if the player holding it cannot follow the lead suit. The off suit jack is considered part of the trump suit and when played, trump is required to follow suit.